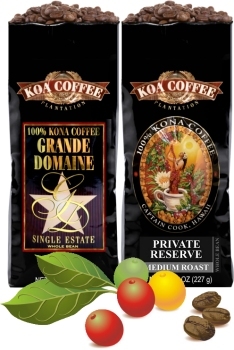 In 1997, Koa Coffee started as a small family business. A true “Mom & Pop” with a little boy and his dog running and playing in the Hawaiian sunshine as they tended their precious Kona beans. Over the years, our hand-picked Kona Coffee has won the coveted Gevalia Cupping Competition, PCCA Coffee of the Year, we were featured in Forbes "Top 10 Coffees of the World" and we made Forbes' "50 of America's Best" as the "Best Coffee in America." With much Mahalo to our friends and our many loyal customers, Koa has grown and continues to grow. Along the way, we became the American dream, proudly providing employment to the many staff who bring their friendly smiles and Aloha spirit to Koa Coffee. Except, perhaps, to become better as we adopted more quality control than we had in those early days. We have better roasters, so every batch is perfect, every time. We have better packaging too, so our coffee smells just as fresh when you open the bag as it did when we sealed it. These days we are also exploring other premium coffees from Hawaii and celebrating their unique flavors. We still pick every bean by hand, harvesting only when the beans are cherry red. No mechanical harvesting that would mix bitter green beans in with the red. We have real people roasting your coffee and real people packing every order. And, we still cup every roast to be sure the taste of Aloha is spot on, every time. At Koa Coffee, we have always been dedicated to offering our customers the finest Kona Coffee experience, while also sharing the beauty and Aloha of the Hawaiian Islands. That’s who we are, and that's who we will always will be. Much, much Aloha to you!